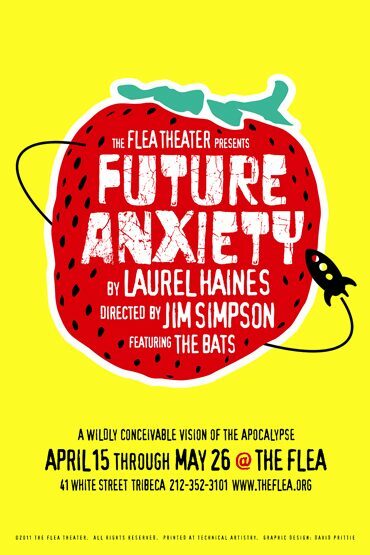 The Flea Theater presents The Bats in full force in the World Premiere production of FUTUREANXIETY by Laurel Haines, directed by Jim Simpson and starring The Bats, the resident acting company of The Flea. Previews begin April 15, with opening night slated for Thursday, April 28. FUTURE ANXIETY is set in the not-too-distant future. Unfortunately, the planet’s become uninhabitable. Fortunately, Karl’s built a spaceship. In this fiercely intelligent and wildly conceivable vision of the apocalypse, a new generation tries to make sense of how to live on a planet with increasingly drained resources and suspect inhabitants. The production features The Bats Brett Aresco, Allison Buck, Holly Chou, Ugo Chukwu, Katherine Folk-Sullivan, Grant Harrison, Alex Herrald, Josephine Huang, Amanda Idoko, Raúl Sigmund Julia, Yvette King, Vin Kridakorn, Maren Langdon, Betsy Lippitt, Seth Moore, Joy Notoma, Reynaldo Piniella, Donaldo Prescod, Anita Sabherwal, Joann Sacco, Keola Simpson, Hansel Tan and Monica Wyche. The design team includes Kyle Chepulis (set), Brian Aldous (lighting), Sydney Gallas (costumes), Patrick Metzger (sound), David Prittie (graphics) Kate Sinclair Foster (props) and Michelle Kelleher (stage manager). Laurel Haines writes plays and musicals. Her play The Dianalogues, about the public’s obsession with Princess Diana, has been produced in the U.S., Canada, Great Britain, and South Africa, and is published in Women Playwrights: The Best Plays of 2003 (Smith and Kraus) and Best Women’s Monologues for the Millennium (Applause Books). Future Anxiety, a dystopian comedy she wrote after thinking too much about plastic bags, was developed in the Lark Playwrights Week 2009, had staged readings at Chicago Dramatists, the Great Plains Theatre Conference, and Stage Left Theater, and was a finalist for the National New Play Network’s Smith Prize. She has written book and lyrics for musicals including Stones of Wisdom, a puppet musical for young people commissioned by First Stage Children’s Theater in Milwaukee, WI, and Beach Wars, co-authored by Nan Hoffman and Howard Pfeifer and presented at the Stages Festival 2006 in Chicago. Other plays include Gun in the Funnies (staged reading in Kitchen Dog Theatre’s New Works Festival 2009), Raw Footage (Arizoni Award, Best Original Script 2000), and Potatoes and Radio City (Collaboraction Sketchbook 2004 and 2005). Laurel has a B.A. in Anthropology from Brown University and an M.F.A. from ASU, where she studied with Guillermo Reyes. She recently moved back to New York after many years in Arizona and Chicago. Laurel is a member of the Dramatists Guild.